Vince Lombardi, director of Audio Journal, at the controls where volunteer readers keep those who are blind or visually impaired up to date with community and national news and events. This article was originally published in the Dec. 30, 2017, edition of the Sun. Purchase a Worcester Sun membership for as low as $2, and receive a free copy of our print edition if you live in our home delivery area. Remember to sign up for our email newsletter below and let us deliver the news to you. Audio Journal is part of a statewide network of towns that carry the Talking Information Center (TIC), which started in Marshfield in 1977. 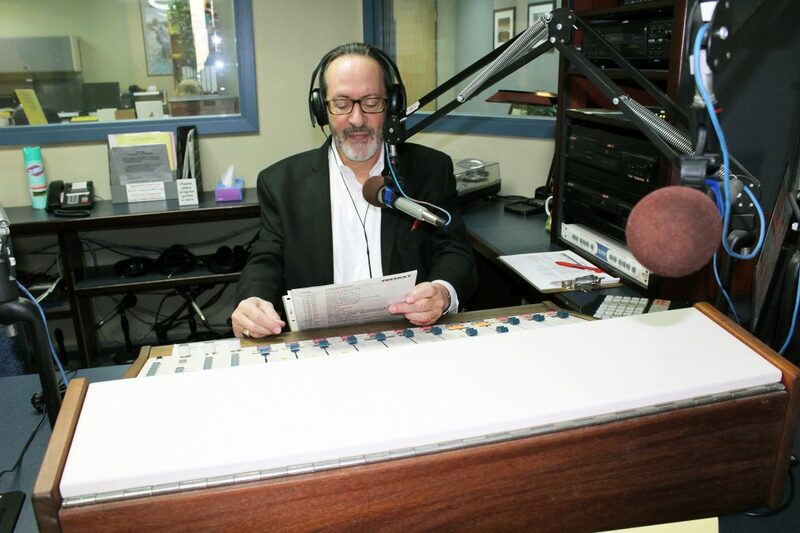 While TIC programming runs 24/7, Audio Journal provides broadcasts eight to nine hours per day from its studio at 799 West Boylston St.
“Some programs are pre-recorded, but most are live,” said director Vincent Lombardi, who has been at the helm since 1999. “We have two volunteer DJs interacting with each other. It’s fun for them to learn about how to run a radio station, and they also take calls from the listening audience. We train our volunteers on how to run the audio board, and that makes it more exciting than just reading. Every morning readers broadcast the local obituaries, news, business, sports, commentary and advice columnists from the Worcester Telegram & Gazette, and other local papers: Worcester Magazine, Worcester Business Journal, Boston Globe; 30-plus community newspapers from throughout Central Mass. ; and regional/national publications such as Yankee, New Yorker, The Wall Street Journal, National Geographic, People and Time. The station has about 150 volunteers who help out in various departments and tasks, and more are always welcome. With a limited budget, those volunteer contributions equal more than $200,000 saved in monetary value and so much more in “thank you” value for those who daily depend on these services for information about their communities. 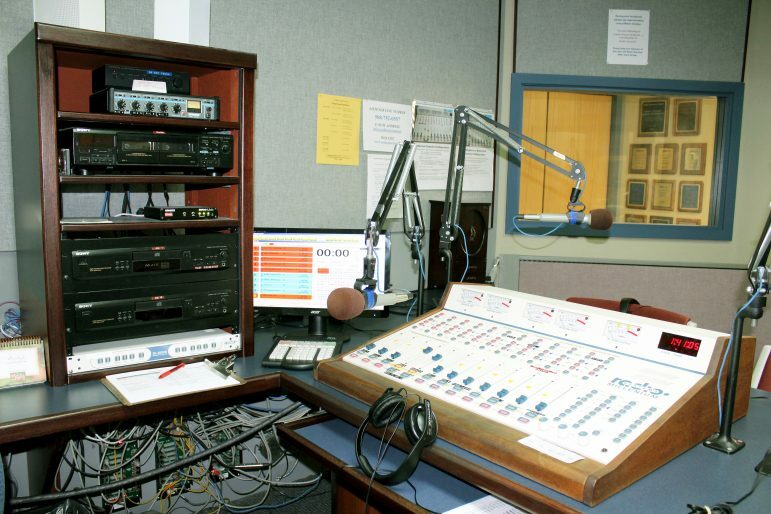 In addition to being an on-air broadcaster, volunteers (vision impaired, sighted individuals and those with other disabilities) are needed to support the book clubs, administrative tasks, listener liaisons, audio engineers, committee members and mentors. Lombardi said several volunteers have stayed on and served for more than 20 years. And when not broadcasting its own content, Audio Journal hits a switch and TIC (Talking Information Channel) programming returns on the radio in a seamless transition. “We are not on an open band. … We are on a subcarrier frequency, similar to the Muzak technology that one used in elevators in the 1960s and 1970s. In fact, a blind person founded Muzak,” Lombardi said. Close-up of the monitor board. “Our No. 1 priority is finding listeners so that there are as many people listening to us who can benefit from the radio shows,” Lombardi said. He said there are about 5,000 legally blind people in Central Massachusetts, and that the nonprofit Audio Journal reaches about 3,500 of them. But the general public will not find it on a traditional radio. Specially designed radio receivers – free to vision-impaired people in Central Massachusetts – pick up the subcarrier frequencies used by the service. Worcester radio WICN (90.5 FM) is a partner with Audio Journal. Lombardi said that FM radio often has additional frequencies that are not used. “Since we use the subcarrier, one needs a specially tuned radio to access that broadcast on the FM side. That’s one of the ways that people hear us, and we give away those radios to people who need them,” Lombardi said. Anyone can benefit – one doesn’t necessarily need to be blind. It may help people who are learning English as a second language because one can follow along with the newspaper and hear the broadcast that is read on the radio. Audio Journal archives about 90 percent of its programming. If someone missed the obits in the morning, they can access the program in the afternoon. It also partners with 42 other communities throughout Central Mass., and uses their public access television signal, also known as SAP, to provide more programming options. 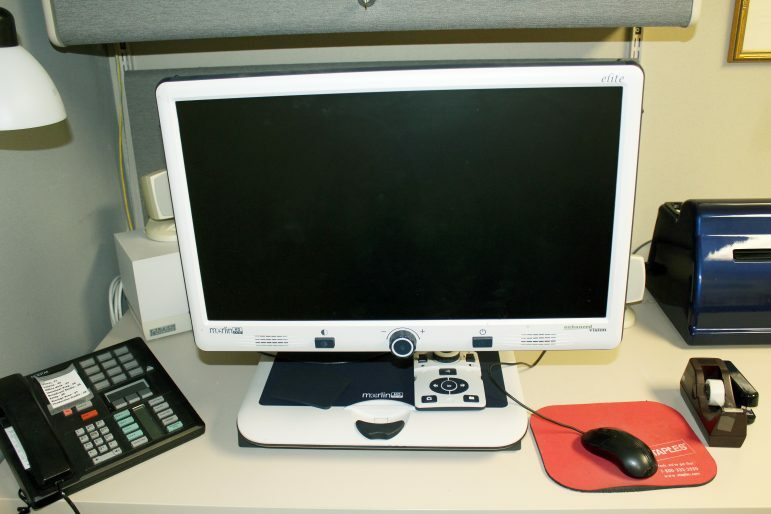 A specialized computer for low vision or blind individuals … used by trainees and interns to sharpen job skills. Valerie Clapham, volunteer coordinator, administrator, programmer, leader of the Audio Journal book club and a member of the advisory committee of the Worcester Talking Book Library, has helped hundreds during her 15-year tenure with Audio Journal. She is also a radio reader, an instructor for the organization’s high-contrast keyboard computer for the blind and visually impaired, and a mentor to trainees and interns. Lombardi said Audio Journal recently said goodbye to a former outreach and development coordinator, who was there for six years. She was recently offered a full-time job. She has low vision and thrived at Audio Journal. “So this position is designed to be a stepping-stone to full-time employment in a typical office setting,” he added. Clapham will also soon leave Audio Journal and return to her roots in England. Regarding the book club, Lombardi said Clapham has five or six volunteers come to the studio and have a discussion about a book. “That’s when people often call in and voice their opinion about a book. We also have authors come in and participate with the book club here in the studio,” he said. Books are chosen months in advance and are always available as audiobooks at the Worcester Public Library. “We’re always looking for what is pertinent to the local population,” Lombardi said. The four key areas for access are radio receivers, internet, newspapers and cable TV (Channel 192 for Worcester). The TV channel will have written information on the screen, and the audio portion will be read by volunteers at Audio Journal. Of the four, radio is probably the favorite method of communication for Audio Journal listeners, according to Lombardi. He said internet radios can be quite expensive for the organization to provide, costing hundreds of dollars compared to the $25 or $35 cost of the radio receivers. As the internet plays a larger part in everyone’s lives, Lombardi said Audio Journal will likely expand within that realm. There is also a telephone service called Audio Now, allowing users to pick up the Audio Journal stream. Lombardi added that there is a great variety of programming. Most of it is reading from a newspaper, but there are also interviews on services and events within a town; a radio theater volunteer group, which he said is a lot of fun; a sports program for people with disabilities; programming for kids on Sundays; an African-American Experience program on Tuesdays; “The Armchair Traveler” travel program; a cooking program called “Cooking in the Dark” … and more. Reader volunteers take their jobs seriously. Most work in two-person teams, taking turns reading a portion of the news or a book in 15-minute intervals. Lombardi said, “Usually, they’ll come here about an hour before they go on the air and this is where they’ll take materials that we provide and they’ll hash out what they’ll lead with … who will do what and who will introduce the next segment and dozens of other things before a broadcast. “When that light goes on, you want to know exactly what you’re going to do. And to know the date and day of the week. The Roy Allen Educational Studio at Audio Journal. The initial studio was housed in a closet in the Worcester Public Library, Lombardi said. Then they moved to the former location of WICN on Chatham Street, and then to Lincoln Street — which was a more of a subterranean cave and not accessible for many — and then finally to the current location on West Boylston Street in 2003. 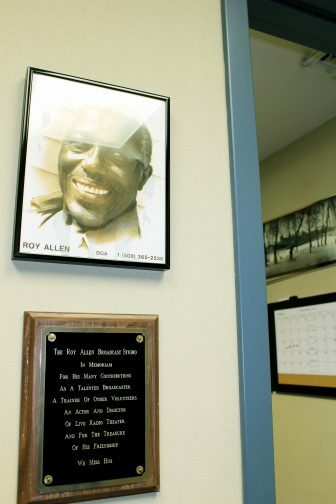 The current space is dedicated to Roy Allen, a well-known video and audio producer in Harlem who retired in Clinton and was a longtime volunteer at Audio Journal. Audio Journal has also trained people with low vision to edit audio. “We’ve also had good success with blind individuals doing this work. They get it … to make the broadcast a natural sound, but it is a challenge, and it takes some time to learn it. And by doing this, it is a good transferable skill. They have to be precise and it gives them a true sense of contributing to the programming,” Lombardi said. “This would be useful as an introductory course for someone interested in eventually producing audio clips in a studio. But there is a level of sophistication they would have to achieve. But if someone had this training, I think they would be able to ‘get it’ a bit quicker,” he said. Also on the production side, some of the community work involves the Hanover Theatre for the Performing Arts, where descriptions of the live action of a performance are delivered in Braille. And Audio Journal also gives patrons a synopsis of the play, similar to a playbill, in Braille. “In theory, we could do some of these services as a fee-for-service if some company wanted to do something in Braille, or if they had printed material [they want] turned into an audio format, we can do that, too. It’s another way we can get some unrestricted funding,” Lombardi said. Last year Audio Journal did the audio descriptions for the Worcester Art Museum’s Medieval Gallery. “They wrote the scripts but we did the production work. So what you hear is us describing what is on the walls. It’s good for low-vision or blind patrons, and it is good for people who are not affected by vision problems to be aware of this type of service,” Lombardi said. Vince Lombardi, director, near the Audio Journal awards for excellence in broadcasting. 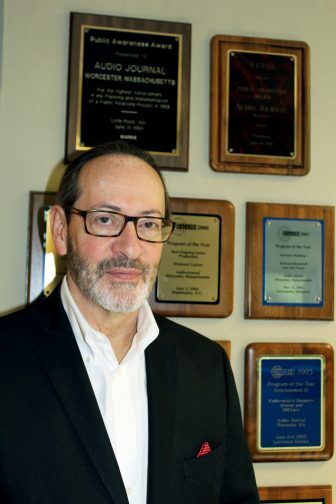 For Lombardi, landing at Audio Journal began as a volunteer, reading scripts and news in 1995. “I actually followed in my oldest daughter’s footsteps. She had found out about this type of service and started reading on Sundays. When she got a few years older and moved on with her life, I started thinking … I can do this … and I loved the medium of radio and it attracted me to do something substantial with my life that was meaningful and helpful. “And little by little, people started asking me if I wanted to produce some public service announcements … Then it was, ‘Do you want to learn more about the equipment?’ … ‘Do you want to train volunteers?’ … ‘Do you want to become the director?’ What? “And then I was introduced to the whole world of nonprofits,” he said with a sigh. He reached out to the Talking Information Center and “I was thinking we could produce a variety of more programs; working with theater groups, doing more interviews. And I was flying by the seat of my pants,” Lombardi confessed. Opportunities came and Audio Journal took advantage of them. He said he eventually saw how we could have blind trainees come in and naturally evolve into doing audio descriptions for theater, city hall events, art museums and so on. All of that came about naturally. Two of the organizations that most helped Lombardi and Audio Journal are the Greater Worcester Community Foundation and the Memorial Foundation for the Blind. The Greater Worcester Community Foundation was a key contributor because Lombardi did not have experience writing and applying for nonprofit grants. But the GWCF offered free courses on how to apply for grant monies and how to structure and maintain a nonprofit budget. Lombardi said the GWCF has been a great resource, both for funding and for education. But it is the Memorial Foundation for the Blind that provides the greatest philanthropic gift to Audio Journal today. Today, its annual contributions comprise about 40 percent of the total budget. The Memorial Foundation’s beginnings date to 1905 – a time when the disabled and blind were shuttered away in institutions. But this organization had a different idea of how to treat the disabled. Lombardi said the original headquarters, within a stone gothic building, still stands behind the old Worcester Courthouse … and they would house and care for people who had disabilities. Men fared a little better than women because they were taught to do chair caning in the carriage shop out back. So at least they had some money to spend on the luxuries of the day. Also, they became more self-sufficient through their earnings. As the years went on, the organization became a funding and charitable foundation, Lombardi said. “When we came to town,” Lombardi said (“we” being originally the Talking Information Center in 1977, which evolved into Audio Journal in 1987), “they [Memorial Foundation for the Blind] realized there was a great need for this type of service, and they decided to expand throughout the state. The only remaining state-sponsored source for Audio Journal is through an individual town’s choice to provide contributions from their individual Massachusetts Cultural Council monies. If town residents receive Audio Journal services, then the Journal is eligible to receive compensation from that town via the Massachusetts Cultural Council in Worcester County. Twenty-eight contributed last year through their own individual grants for operating expenses, training and equipment: Ashburnham, Auburn, Barre, Berlin, Bolton, Charlton, Clinton, Dudley, Fitchburg, Grafton, Hopedale, Hubbardston, Leicester, Millbury, Northborough, Oxford, Paxton, Rutland, Shrewsbury, Southborough, Spencer, Sterling, Sturbridge, Sutton, Uxbridge, Webster, Westborough and Worcester. If a city or town has its own local channel on TV, residents with impaired sight can listen to Audio Journal on that local channel or they can tune in on their specially equipped radios. Local civic clubs, such as Lions, Kiwanis and Rotary, also chip in to keep Audio Journal on the air. Lombardi also holds special fundraising appeals. Last year’s Dining in the Dark (patrons eat with blindfolds on) at the Bull Mansion on Pearl Street was a stunning success. This year, another Dining in the Dark food adventure will be held in the banquet hall at Cyprian Keyes Golf Club in Boylston on May 19. With the majority of baby boomers reaching their 70s and 80s in less than 15 years, it is expected that more than 30 percent of this population will have significant problems with their vision. Lombardi said that as people start to have problems, most will turn to audio for their daily information. Yet, as the population grows, technology is improving as well. He said he is confident that Audio Journal will figure out different ways to serve these people. “I think that is the future … and maybe at some point, 20-30 years from now, this type of service will be obsolete,” he said. To volunteer, contact Lombardi at the station’s main phone number or email: vince@audiojournal.net.